inMotion now offers a time tracking feature that is as simple to use as clicking a stop watch. It reports time invested broken down by specific tasks and by team member – allowing you to more accurately calculate project profitability. Tracking time on projects will provide better future predictability on similar projects and makes it easy to track billable hours too. It’s easy to use. 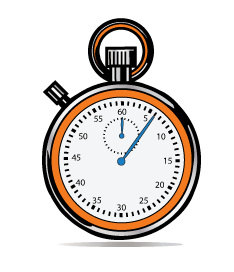 Team members start and stop the timer next to a task or project. Time is calculated and a running project time is displayed. A total project time report provides a breakdown of where time was spent by team member. It’s just one more way inMotion is helping you get to the finish line. If you want to know where your team’s time is spent and which projects give you the most ROI, please email us or give us a call at 888-462-8044. The new Time Tracking feature is available free as part of an existing subscription for all inMotion customers.